If you’re getting ready to start your business one of the first things you should look into is getting 1-800 services. Setting up a 1-800 phone number is fast, easy and affordable. And it’s a great way to help your business look and sound professional right off the bat. UniTel Voice offers low-cost plan and makes it easy to do a quick 1-800 search so you find a toll free number that works for your business. Traditionally businesses have set up 1-800 numbers because they were toll free, which means that the cost for the call is borne by the party that is being called and not the person that is making the call. However, innovations in the 1-800 service industry have made using toll free numbers one of the most popular ways of marketing and promoting businesses to the general public. The ability to call toll free is no longer the primary reason a small business should get a toll free number. The main reasons are as follows. 1. Toll free 800 numbers are portable. This means you own your business 800 number and you can transfer the number from one company to another easily and without service interruption. Only toll free numbers have special portability rules and procedures set up by the FCC to protect business owners. Local numbers do not. 2. 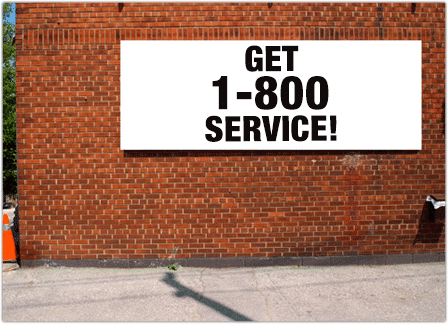 Using 1-800 toll free numbers gives your business credibility and a big business appeal. Because established businesses use 800 numbers, consumers have gotten used to seeing 800 numbers as business phone numbers. It seems odd to use a local number unless you are a local mom and pop shop. Therefore, if you’re a startup company, you can give your image a slight boost by using an 800 number. with UniTel Voice, you can get a toll free number priced and designed for growing startups. And we have a special tool that you can use to search for available 1-800 numbers. If you can’t find the number your looking for – let us know and we’d be happy to help you search. 3. Toll free numbers include features that help you stay connected and sound professional. Having an 800 number on your website or business cards may make you look more credible but what if someone calls your toll free number? Will you sound like you have a professional business phone system or will you sound like you’re a guy running his business from his cell phone? With UniTel Voice you can have your cake and eat it too. UniTel Voice offers a professional virtual office phone system that works with your cell phone and costs about $10 bucks a month.